"If you are away from home but would like to feel like home, then you should consider Corporate Apartments Bucharest. 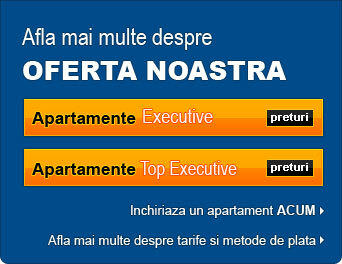 Nice apartment and prompt and reliable service enables you to focus on your main reason for your staying in Bucharest. Inside the apartment you have all you need and, if you need more, it is just one phone call away. Thank you guys !" “I would highly recommend staying with Corporate-Apartments.ro during any stay in Bucuresti, especially a long service stay. Corporate Apartments Bucharest have successfully combined the comfort and privacy of your own home with the service levels of any major hotel. The apartments themselves are extremely modern and comfortable. The convenience of a "one price" for all costs is easy to manage, which is important when considering rent costs and the numerous utilities required for comfort and safety. It is a simple as being handed a key and turning on the lights! The major reason Corporate Apartments is a step above the competition is their commitment to service levels. From the staff that takes care of the bi-weekly cleaning, to the personal pick up at the airport, the management and all the employees are committed to excellence. I was impressed on the first day when I was picked up at my hotel, driven to the apartment and then taken on a guided tour of the city. In consideration of the genuine care and thought demonstrated, I ended up staying in an apartment in Piata Romana for 1 year. Corporate Apartments will make your stay in Bucuresti not only comfortable, but very enjoyable. I will be staying with Corporate Apartments on my return business trips to Romania over any of the major hotels in the area and have already recommended business colleagues to their apartments." “I was almost disappointed when I was searching for an apartment in Bucharest, until I saw the apartment maintained by Corporate Apartments Bucharest This was actually occupied by my colleague and once he left I immediately booked it for myself for 2 reasons. First, the apartment is maintained very well, it has all the modern amenities and a good view. Secondly, my colleague told me they are very interactive, friendly and prompt in their services. As far as my experience is concerned, besides good view, modern amenities and the way it's maintained, I am very happy the way they made me feel at home. I hope to be in touch with Corporate Apartments when I happen to visit Bucharest again." “I would recommend Corporate Apartments and its staff to anyone but especially those new to Bucharest. They offer a variety of properties to choose from that are located in highly sought after locations throughout the city. The apartments they presented to my colleagues and I were all modern, clean and designed in a way to make you feel closer to home. Any issues we had were addressed in a timely fashion, even on weekends. If you're seeking more than just a place to live and prefer higher quality amenities as well as a more reliable real estate firm representing your interests, Corporate Apartments Bucharest should be your number one choice." “I was in Romania for four months during which time I stayed in an apartments offered by Corporate Apartments Bucharest. The staff they have was perfectly accommodating. They answered all of my questions, picked me up and showed me a variety of very nice apartments. They always made me feel welcome and comfortable. I enjoyed staying in my beautiful apartment - it was very comfortable and I had the comfort of knowing I could call them anytime I needed them. I recommend www.corporate-apartments.ro to anyone to goes to Bucharest on personal or business travel. Thank you again for making my stay so easy!" “It is not easy to find accommodation in Bucharest. After several unsuccessful attempts, I was happy to meet Corporate Apartments Bucharest. Different from all previous landlord candidates, this company was not late and even provided me short, but pleasant tour in centre of Bucharest. High level of service and positive surprises continued over my almost two year long stay. I was supplied with necessary appliances whenever needed, all issues were fixed fast and efficiently. Many thanks and keep up the good work!" "Outstanding customer service; Impecable flats; Making your life away from home as comfortable as home. What more could an expat ask for?"